I’ve had it in mind to address some of the wrong-headed, yet widely-held doctrines that have a negative effect on Christians, there’s no better day to start this than a few days after a predicted “end-of-the-world” rapture has passed unfulfilled. Although I’m disturbed by how the prediction of such a small Christian group has received so much media attention, I do give them kudos for putting their money where their mouth is. The organization invested millions of dollars in propagating their message. Some quit their jobs. Some sold their belongings. Some hired atheist companies that guaranteed the care of their pets after their owners were raptured. But, at the end of the day, this event shows us how important theology is – even bad theology – and how it affects our lives and society. There are some nuances on the idea of the rapture, but basically it is the belief that Jesus will come back and true believers will be taken from the earth to meet Jesus in heaven. Here I just want to outline some of the major reasons by which the church should name the doctrine of the “rapture” as heresy and denounce it. Although this heresy has become part of the mainstream evangelical understanding about the return of Christ, the doctrine is relatively new. You can find it in some 18th century Puritan writings, but it was developed and popularized by Mathew Henry and John Darby in the 19th century and by Hal Lindsey in the 20th century. That means that although the church has had different understandings about the Second Coming since the beginning of the church, the idea of the rapture was not held by any of them. For the church, the concept of the rapture is new. The book in the Bible that speaks about the future of the world more than any other is Revelation. Revelation has no mention of the rapture. The idea of the rapture is read into Jesus’ statements about the end in Matthew 24. Jesus says that as it was in the days of Noah, so will it be in the coming of the Son of Man. People were eating, drinking and marrying until the flood came and swept them away. Likewise, when the Son of Man comes, two will be in a field; one will be taken and one will be left behind. Those that promote the rapture heresy believe that the true believers will be taken and the condemned will be left behind. However, the text says that those taken away, as in the flood, are destroyed; those left behind, like Noah, are “saved” and enjoy life. The rapture heresy is completely backwards. The main text that causes interpreters to believe that Christians will be raptured is 1 Thessalonians 4:15–7, which says that the dead in Christ and then the living will be caught up in the air at the coming of Jesus. Read outside of its cultural context, one can understand why so many would think that they will be raptured from the world. However, in its cultural context, the text speaks of the consummation of the kingdom of God. When a king, in the ancient world, would come to a city, he was announcing the reign of his kingdom over the city. If the leaders of the city, accepted the king’s authority, they would come out of the city to meet the king and bring him to the city to establish or affirm his kingship. This is the image from 1 Thessalonians. The direction of Jesus’ coming is not from earth to heaven but rather from heaven to earth. The believers go out to meet their King so they can be part of the triumphant procession in the full coming of the kingdom. This heresy of Christ coming to rapture his church also implies that there will be a “third coming” when Jesus comes to judge and establish the new heaven and new earth. But a third coming has never been held by the church. If God will save an elect (which is us) from the creation, then we are enabled to exploit the earth and enjoy its plunder without consideration for others (which are not us). Practically, that means we can burn so much fossil fuel that we heat up the globe and make hurricanes, typhoons and flooding more likely and more deadly. Rapture proponents believe that when the real tribulation comes, God will take us out of it. If God will save an elect (which is us) from tribulation, then we are less likely to be involved when others (the non-elect) suffer tribulations. If God is not involved in the tribulation, and His people are not involved in the tribulation in the future, then we (the elect) have no place in tribulation in the present because it is for the damned. If God will secure an elect (which is us) from tribulation, then we too should secure an elect (which is us) from tribulation. The amount that America spends on “defense” could wipe out global hunger (from which 24,000 people die every day). If God will save an elect (which is us) from tribulation, then we do not need to consider the affects of our decisions on future generations (which are not us). Economists continue to promote consumption in order to grow economies. The message transmitted is consume the benefits now without worrying about the costs in the future. thanks for this dave, very helpful and clearing up the sloppy doctrine around something that has little biblical credibility. here are a couple articles i’ve found helpful on this subject, the first from n.t. wright ( http://www.ntwrightpage.com/Wright_BR_Farewell_Rapture.htm )and the second offering a catholic perspective ( http://www.americancatholic.org/Newsletters/CU/ac1005.asp ). thank you David for challenging us to do good biblical theology. kinda glad I’m still part of the “left behind” crowd. This is great contextual analysis for our time. Thank you for writing this – came at just the right moment for me! Rocky2, thanks for reading the post. I don’t post anonymous comments. So, let us know who you are – we want to know and be known. And I’ll continue to post future comments. The real problem of PreTribulationalism is that it is based on the heresy of Dispensationalism, which teaches that there are two Gospels, two ways of being saved, one for the Church and one for Old Testament saints. The ignore the fact that “God, foreseeing that He would justify the Gentiles by faith, preached the Gospel beforehand to Abraham, saying ‘In your Seed all the nations will be blessed. '” The first chapters of Ephesians tell us how we are blessed, and who is blessed. The Gentiles are blessed by being grafted into the Commonwealth of Israel, making us partakers of the Promise, and “one new man” in Christ. Old Testament saints were saved in the same way the New Testament Church is, by grace through faith. New New Covenant made the old one obsolete. The so-called “Tribulation” will not be a return to a former dispensation to deal with the Jews. God has been dealing with them throughout the Church Age, saving a remnant by grace, and grafting us into them. 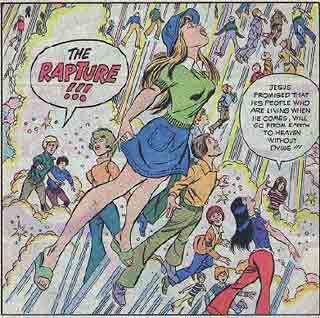 I believe the PreTrib rapture teaching is Satanic. It will leave many unprepared for what is coming, for those who have not counted the cost. When persecution comes, many will fall away from the faith, and the man of sin will arise.